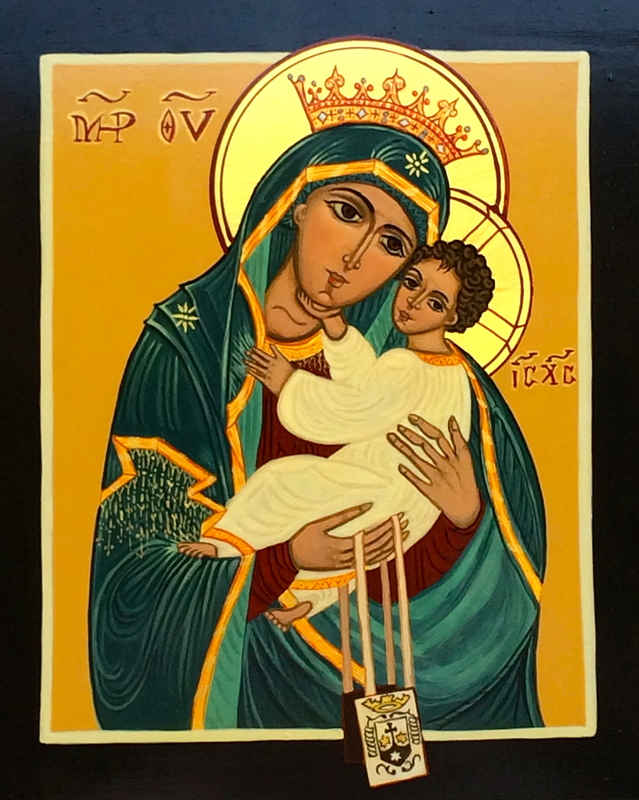 In the icon of “Queen Beauty and Mother of Carmel,” the Infant Jesus tenderly invites us to look at the face of His Mother, “resplendent with grace.” What makes the Virgin Mary’s face “resplendent with grace?” It is the light of the Face of Christ – just as the moon reflects the light of the sun, the face of Mary reflects the light of the true sun, Jesus Christ. At the present moment, although the world is filled with darkness, we can turn to her for help in seeking His Face and leading souls to Him. Even pebbles on a path on the ground can reflect the light of the moon at night; and so the children of Mary by following her example, “to seek the Face of God in all things,” can guide others through the darkness by reflecting the light of the Face of Christ as does Mary. It is Jesus Himself who desires that we turn to the face of His Mother. He created her with all the perfection and beauty that would be fitting for the Mother of God. Her soul, holy, immaculate and unstained by sin, is the perfect mirror in which He reflects His Face. He holds her up to us as the model for all His disciples as He did in Luke’s Gospel: “While He was speaking, a woman from the crowd called out and said to Him, ‘Blessed is the womb that carried you and the breasts at which you nursed.’” This singular praise of Mary from the woman in the crowd was not enough for her Son. And so Jesus replied, “Rather, blessed are those who hear the word of God and keep it.” (Luke 11:27) Mary is thus thrice blessed, first, in being chosen to be the Mother of God, second, in that Mary heard the word of God and third, because she kept His word in her heart. Mary holds out to us her Scapular, a sacramental sign of being clothed in her own garment, to place over our shoulders, so that we may imitate her in faith, hope, charity and all the virtues that adorn her soul. By contemplating the Face of Jesus always, together with Mary, we can do our part in making His Face shine upon our world as well. O most beautiful flower of Mount Carmel, fruitful vine, splendor of heaven, blessed Mother of Christ, Immaculate Virgin, we praise and honor you as our Queen and Mother. Help us to persevere in constant prayer for the needs of our world and share with you in the work of redemption. Be with us, Holy Virgin, and guide us on our way, as we journey together in faith, hope and love to your Son, Jesus Christ Our Lord.